Are you going through a divorce? 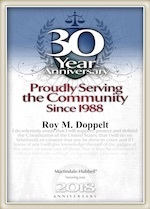 Trust the divorce lawyers at The Law Office of Doppelt and Forney, APLC to be there with you every step of the way. From child custody, child support, spousal support to division of assets and debts, we can help. Call today to schedule your free consultation with an experienced San Diego divorce attorney. If you are thinking of hiring a lawyer to represent you in your divorce case, it is important to first schedule a consultation with the attorney. An in-person consultation is the best way to get to know your potential attorney, as well as the office and environment, understand how the process works, and make an informed decision. The length of a divorce proceeding certainly varies from case to case. Some of the more common factors that tend to affect the duration of a divorce matter include the relative contentiousness of the spouses, whether there are children involved, the amount of assets and debts to be characterized and divided, and the involvement of highly experienced family law counsel. The last item, consulting with an attorney, is especially helpful to protect one’s financial and legal rights, while at the same time moving the process along as efficiently as possible under the circumstances. Since each state has its own marriage and divorce laws, it is important to reach out to an experienced family law attorney from the local San Diego area. In protracted divorce cases, in which the parties spend a great deal of time litigating the issues, courts may require one party to assist the other in paying attorney fees. Under Section 2030 of the California Family Code, the court will look at whether an award of attorney’s fees and costs is appropriate, whether the parties have a disparate access to funds to retain counsel, and whether one party has the ability to pay for the legal representation of both spouses.